RIO DE JANEIRO, Brazil – SuperVia Trens Urbanos (SuperVia Urban Trains) is a major Brazilian railway company based in Rio de Janeiro. Founded in 1998, SuperVia’s railroad network encompasses 102 stations on eight lines in 12 cities and served more than 164 million passengers in 2014. SuperVia recently completed Phase 1 of its station renovation program in its main Central do Brazil terminal and other stations. The improvements included the installation of a HARMAN Professional IDX Information Delivery System with extensive audio, paging, video and control capabilities. The IDX Information Delivery System is a complete hardware and software solution that provides paging, background music, pre-recorded message and life safety capability for railways, airports, transit facilities and other commercial applications. The system employs components from various HARMAN brands, all networked to operate seamlessly together. 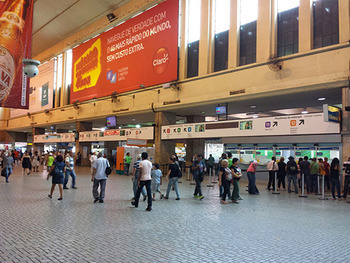 The Centro do Brazil Terminal’s installation employs eight BSS DT715 dispatch microphone stations, four BSS BLU-800 digital signal processors, BSS server/DAC digital audio controllers, 18 Crown DCi Network 8|300N power amplifiers (some used as backup units), AKG wall-mounted security/surveillance microphones located throughout the facility and additional components. Four BSS-DDC-4 four-output digital display controllers are used to control the main “big board” information displays at the Centro do Brazil and Deodoro Station terminals. As part of its comprehensive public address and life-safety capabilities, the IDX system provides automated announcements for the Centro do Brazil Terminal and all 102 stations on the line, and interfaces with the existing SPRINS train schedule database and Engesis automated train tracking interface. “We chose the HARMAN IDX system because it not only fulfilled but exceeded the requirements we had at the time we initially specified what we needed,” said Ferreira. “Once we started to really get to know IDX’s capabilities we realized it was far more capable than what we had first thought, and as a result we’ve evolved our system requirements to move to a new level of quality in our communications capabilities.” The SuperVia system enables complete, independent control of multiple zones, signal routing and switching and other information delivery functions. “You can do everything with the IDX system,” Ferreira concluded. “Nowhere else in the market can you find a single manufacturer that provides such high-quality equipment with such a huge range of features and offers premium after-sales support – all at a price we that fit within our budget. It’s a dream come true." Additional upgrades to SuperVia Trens Urbanos are slated for the future. “What we have today is exceptional – but it’s only the tip of the iceberg as to where we want to go with IDX,” noted Ferreira. “Our goal is to have complete, 100 percent integration of all audio and video communications with all types of media in every single one of our stations, maintenance facilities and operational centers.” RIO DE JANEIRO, Brazil – SuperVia Trens Urbanos (SuperVia Urban Trains) is a major Brazilian railway company based in Rio de Janeiro. Founded in 1998, SuperVia’s railroad network encompasses 102 stations on eight lines in 12 cities and served more than 164 million passengers in 2014. SuperVia recently completed Phase 1 of its station renovation program in its main Central do Brazil terminal and other stations. The improvements included the installation of a HARMAN Professional IDX Information Delivery System with extensive audio, paging, video and control capabilities.